This system is composed of a beam attached to a motor, and a ball placed on the beam. The ball is allowed to roll with one degree of freedom along the length of the beam. The control goal is to place the ball at certain desired position, by changing the beam angle.This kind of system type is often encountered in control applications. This unstable system is a good example for learning how control techniques can be applied to stabilize a plant. Two different control strategies have been implemented: manual control and PID control. This simulation shows a ball balanced on a beam. The beam is controlled by a motor, and adjusts accordingly to the ball's location. 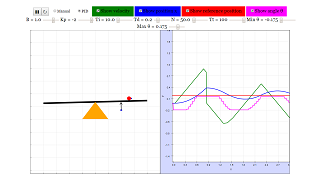 The graph on the left shows the actual ball and beam, while the graph on the right shows the graphs of velocity (green), x-position (blue), reference position of the beam (red), and the angle between the beam and the horizontal (magenta) against time. Do play around with adjusting the different parameters with the sliders and see their effects on the system.